I never really reviews powder because I cant really seems to differentiate between who actually performs, my foundation or my powder. But recently I have been trying this due to my lazy foundation days. I got to try this alone on my face. So let see what I think about it. What I like about this powder is that is really match my skin. It looks super natural and does not feel heavy at all. It blends out smoothly! In terms of packaging, it comes in a very high quality plastic package and it comes with a sponge and mirror. Points to that! Along side to the ease of application, I think its pretty good and convenient for touch ups! As I said I love how it blends so smoothly without feeling that much of application. For scent, this powder does have some scent, it is not overpowering tho, but just nice. It have nice fresh powder scent to it. Lastly regarding longevity, this powder stays matte for 1- hours only. It was okay. As I do a lil research this powder have 5 shades. Which is pretty good. Also it have ingredient such as Vitamin C & SPF 15! So far I don't have any dislike to this product, as to compare to the price, I think its reasonable to what and how it performs. I really recommend this for any one who love to use light coverage powders. Just to get that nice fresh face and protected since it have SPF 15 in it. Also really recommend this to young girls out there. Its affordable and suits young girls more because its more natural and light. Have you tried any Pixy products? What is that? best x? sab suka, best! true! i dont know why, but this powder is just nice! I love how it feels on application! true! sab first time pakai, and fell in love with it dah! saya pakai yg yellow beige tu. dah dekat 3 tahun pakai pixy ! sangat2 puas hati. wah awak pn lama gak! hehe.. best kan..
agree with u Sab. this product memang best! kita pun pakai pxy! yeah best kan! high five! Bedak ni memang superb, been using it fr two years now! Great review! I pun macam nak cuba bedak ni. 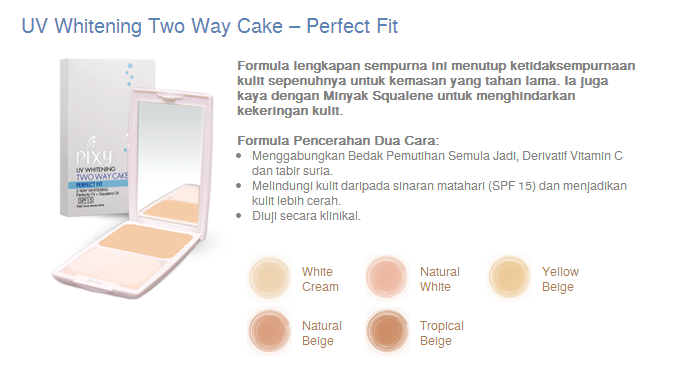 Tapi warna-nya tak banyak pilihan kan. Ingat nak cuba Natural Beige sebab Tropical Beige terlalu gelap. Thank you! ^_^ aah, not that many of shade choices, but the powder is fine and the color does not really obvious. by means if you apply it, it does not really took of your original skin color. I'm using nc30 for mac. Ape shade yg sesuai untuk pixy? macam mana nk dapatkan produk ni?